Electric two-wheelers: how big will they be? 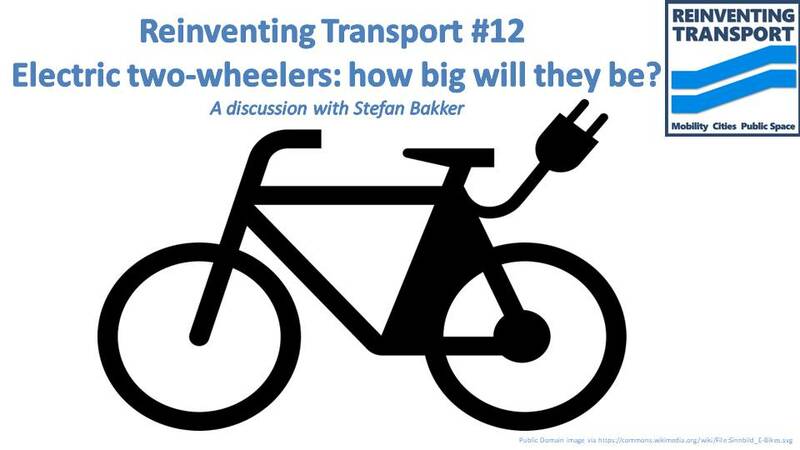 Stefan Bakker sees a big future for electric vehicles with two wheels. I asked Stefan to join me for this month's Reinventing Transport, after reading his “Electric Two-Wheelers, Sustainable Mobility and the City”. Learn more about Stefan Bakker via LinkedIn or ResearchGate. Electric two-wheelers, such as e-bikes, get less attention than electric cars or even electric buses. But two-wheeled electric vehicles are increasing in numbers faster and are already making more of a difference to carbon emissions than their larger cousins. Why are their numbers surging? How much potential is there? Which kinds will take off, the lighter/slower or the heavier/faster? (Do you see the double meaning in the title?) What benefits and risks/costs do they have? What policies are appropriate? Stefan and I tackled these questions and more. Stefan was prompted to write about electric two-wheelers after several years working in Southeast Asia where he noticed the importance of motorcycles. This prompted him to wonder about the potential to replace them with less harmful electric two-wheelers. [2:55] Stefan sees some role for almost all of the many different types, depending on the context. We discussed how this is working in the Netherlands and in China. Vietnam and Singapore also got a mention. [4:02] We tried to clarify the different types and their (sometimes confusing) names. Some are low-speed (up to 25 km/h), some go up to about 45 km/h, and some are basically e-motorcycles. Some lack throttles and require pedalling to get the electric assist (‘pedelecs’). Others have a throttle, which can be with or without pedals. There are ‘Speed pedelecs’ that have pedals but can reach 45 km/h! The term e-scooter is ambiguous currently, with some using the term for an electric step-through motorcycle and others using it for electric versions of kick-scooters that you stand on, like those used by Bird for example. Be careful! [5:42] There is an urgent need to decide which types can and should be allowed in dedicated bicycle paths and which are too fast, heavy and/or powerful to share space with bicycles. Stefan explained recent decisions in Amsterdam, which has long also grappled with petrol-engine-assisted ‘mopeds’ limited to 25 km/h. Two electric bicycles used in Deutsche Bahn's bike-share service in Berlin. [8:10] The number of electric two-wheelers is soaring. But which types predominate varies from country to country. In the Netherlands, it is the low-speed pedal-assist pedelecs that are rising fastest. Their sales now rival sales of ordinary bicycles! The perception that they are “cheating” or only for frail or aged people is fading away. We noted that it seems significant that it is the light, low-speed pedal-assist e-bikes that are proliferating in the most bicycle-friendly country in the world. subscribe to the audio podcast (search for 'Reinventing Transport' in your podcast player app or click the symbol that looks like a wifi icon in one of the players at the top or bottom of this article). You can help me make time to continue this work by becoming a Patreon patron. [10:00] Even several years ago, Elliot Fishman and Chris Cherry noted that electric two-wheelers have ‘the most rapid uptake of alternative fuelled vehicles in the history of motorisation’. Uptake seems to have accelerated even more since they said that. China alone has more than 200 million electric two-wheelers. In China and certain other Asian countries, throttled types, especially those with seats but no pedals, are proliferating. See the photos from Singapore. [10:50] Two reasons for the surge in China. 1. In the 1990s, China classified small two wheelers that have pedals as bicycles, not motorcycles, for regulatory purposes. 2. In the late 1990s and early 2000s, many large cities in China banned conventional motorcycles! [12:37] In Shanghai, more than 15% of trips are by electric two-wheelers. Many medium sized cities in China have 20 or 30% of trips on electric two-wheelers. [13:32] Stefan highlighted two ways to look at the question of substitution from other modes of transport to electric two-wheelers. He argued that, whichever way you look at it, electric two wheelers are NOT only substituting for walking, cycling and public transport. They are ALSO replacing large numbers of trips that would otherwise have been by conventional motorcycle or car. [16:55] Should we worry that electric two-wheelers might be a “gateway drug” that leads towards mass car ownership? We argued that this fear is overblown, because two-wheelers don’t force cities to sprawl out at low density, with huge roads and parking space. So long as metropolitan authorities refrain from fostering those things, two-wheelers in even enormous numbers should not necessarily lead on to car-dependence. Taipei’s experience is a case in point. We have interesting precedents in certain countries for mass use of two-wheelers. The Netherlands (and certain other places) shows that bicycles and low-speed e-bikes can play a huge role if they get safe networks of protected bike lanes, quiet low-speed streets or both. China already has mass uptake of electric two-wheelers. [20:10] Electric two-wheelers in China alone accounted for 80% of the CO2 emissions saved by electric vehicles globally in 2017, according to the International Energy Agency’s Electric Vehicle Outlook. Vietnam and Taiwan as well as certain other cities around the world, including Ouagadougou, show mass use of small motorcycles can also happen in certain circumstances (dense cities with modest incomes, congestion, low-speed traffic, a lack of parking space and warm weather?). Subsidies. For example, France offers up to 250 euros. Buying bicycles or e-bikes attracts a tax break in the Netherlands. Nepal has reduced registration tax for electric two-wheelers. India as a recently expanded program to subsidize all kinds of electric and hybrid vehicles with much of it aimed at electric two wheelers. Phase out conventional motorcycles. The Netherlands plans to do so by 2030. Networks of safe routes for bicycles and e-bicycles. This can include segregated bike ways but should also involve large numbers of quiet residential streets that are traffic calmed for low traffic speeds (30 km/h or less). Filtered permeability so larger motor vehicles have a higher detour factor than two-wheelers, as in Groningen in the northern Netherlands. Enhancing connections between mass transit and electric two-wheelers, with parking at stations and, in some cases, bikes on trains. In the Netherlands, about 50% of train riders arrive by bicycle. For more detail, listen to the audio (with the player below or find Reinventing Transport wherever you usually get podcasts or watch the Youtube version below). I used the Otter.ai service for the transcript that helped me prepare this post. As part of my preparations to start podcasting, I have been searching for more urban mobility and urbanism shows. So I thought I would share what I found. If you are not yet a regular podcast listener, maybe this list will tempt you to download a podcast-listening app to your phone, tablet or desktop and get started. UPDATE 1: I have now launched TWO relevant podcasts: Reinventing Transport and the Reinventing Parking podcast. UPDATE 2: I have added THIRTY TWO more since this was first published. Thanks to everyone who has sent tips. I want to help you get perspective on your city and its transport system with the help of simple city types based on their dominant transport modes, such as Walking Cities, Transit Cities, Bus Cities, Motorcycle Cities and Car Cities. This way of thinking about cities is a heuristic (an imperfect mental model or technique that is nevertheless good enough to be helpful). And it obviously is imperfect. For example, real cities often have various modes of transport, and modern cities are really all some kind of hybrid city type. But it is still useful, especially if we add the idea of a Traffic Saturated City, which is a very different beast from a Car City. It is important for change-makers in Traffic Saturated Cities to be aware they are not in automobile dependent cities yet. Singapore's National Day is this week (9 August). 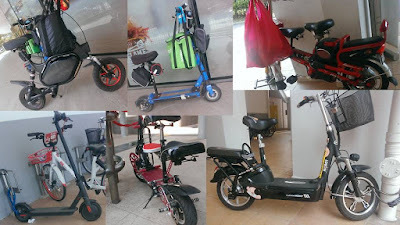 So I decided to share Singapore's urban transport story - or my slightly unusual take on it. It isa unique city in various ways but its urban transport policies are well worth your attention even if you don't live in Singapore. This is a warts-and-all version of the story, and it is my own view, not any kind of official one.